Sapporo Japan. Places to visit on your Japan Tours. I remember when I first arrived in Sapporo, how urban and western looking the city was. I felt like I was in another country. The streets are wide and open and the buildings are tall and modern. It is a fairly new city(about 200 years old) compared to those on the mainland of Japan. The main downtown area is arranged in a grid system, similar to New York, making it very easy to find your way around, and lots of cheap hotels. In the late 1800s Hokkaido approached the American government for help in developing the land, hence the Western influence.You can see some Japan culture around the city but don't expect to see much. Be sure to check out the Sapporo TV Tower in Odori Park. You can enjoy a 360 degree panoramic view of the city. The best time to go is definitely at night when the park is illuminated. Tokeidai Oh yes, the infamous clock tower. One of the most visited attractions in the city. 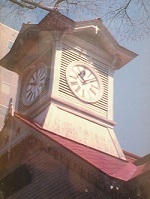 The tower is western-style and the oldest standing building in Sapporo Japan, built in the 1870s and was a drill hall of Hokkaido University. Hokkaido Shrine can also be found in Maruyama park. This is a "must see", especially during the New Year holidays where crowds of people go to pray and get an Omikuji (fortune message). Japanese religion is an amalgam of Shinto and Buddhism. Most Japanese are not very religious but more superstitious. They will follow the major rituals at either the temple or the shrine but they don't necessarily believe in the religion as such. 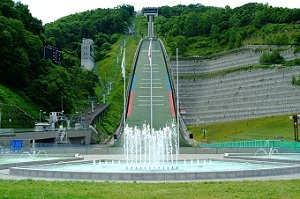 Okurayama Ski Jump was the main ski jump used in the 1972 Winter Olympics. I've never been to or seen a ski jump before(except on TV) so when I heard there was one in Sapporo Japan I had to check it out. I wasn't disappointed. You can actually experience the same view the ski jumpers see when they are sitting on the plank waiting to fly. This univesity has a beautiful campus. 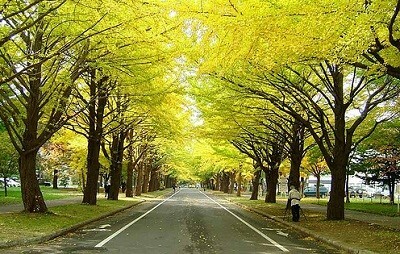 On a regular day this beautiful road is lined with huge gingko trees and is a popular tourist attraction, especially in the autumn when the leaves change to reds and yellows. One of the most popular Japanese festivals, the Hokudai Festival is held every year for about four days in early June. The main campus road area is closed to cars and transforms into a carnival. The entire main Hokkaido University street (about 400m long) is lined with food stalls. Moerenuma Park is one of those modern, stylish Japanese parks, designed by the late sculptor Isamu Noguchi. A very pleasant way to enjoy a day trip if you want to get away from the busy city. And only a short drive away. Great in the summer but opened all year round. Maruyama Park is located in the western suburbs of Sapporo right next to Maruyama hill which is 226 meters above sea level. This huge 60,000-square meter area contains many kinds of trees including oak, magnolia, and maple. The best time to visit is during Golden Week at the beginning of May. The incredible Sapporo Science Center is a great day out for family and friends – or simply those of you who are interested in all-things scientific! Despite being located outside of the centre and in the southeast of the city, it’s pretty easy to find get to in Kagakukan Park.